We’re in the process of trying to empty the freezer. It could do with defrosting and we want to lift it out of the drawer to see what is happening underneath it. Despite there being ventilation holes in both the floor, drawer and front of the dinette we suspect it isn’t getting enough air. So we’ve gradually been eating our way through our winter stock pile of meat. However peas are the only vegetable stored in there and the milk was about to run out, it was time to go shopping. We pootled along to just before Swillington Bridge where we moored up. This was just about the closest we could get to the shops up in Woodlesford. We followed a path up to the road where we had to climb over some very large boulders put there to stop unwanted vehicles from accessing the old site of Bentley’s Brewery. 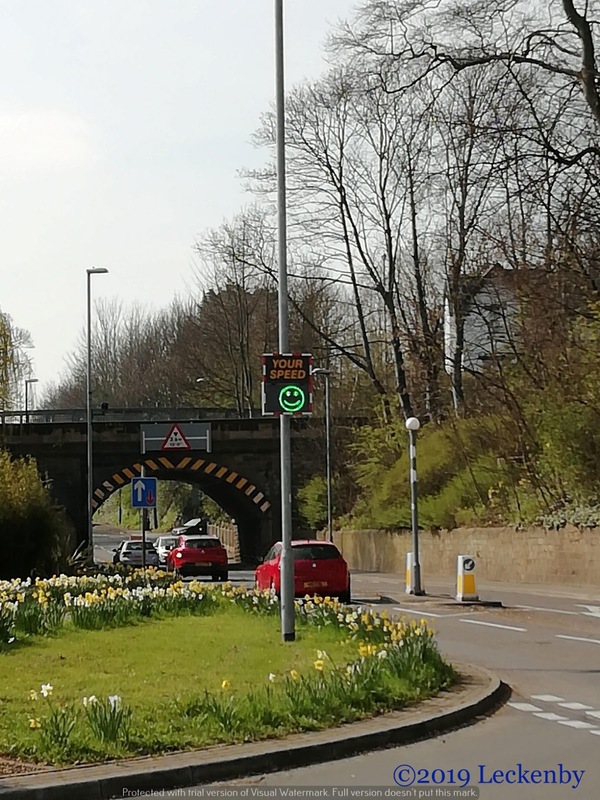 Then up the hill under the railway where cars got either a green happy face or a grumpy red face depending on their speed. First port of call was the Co-op. 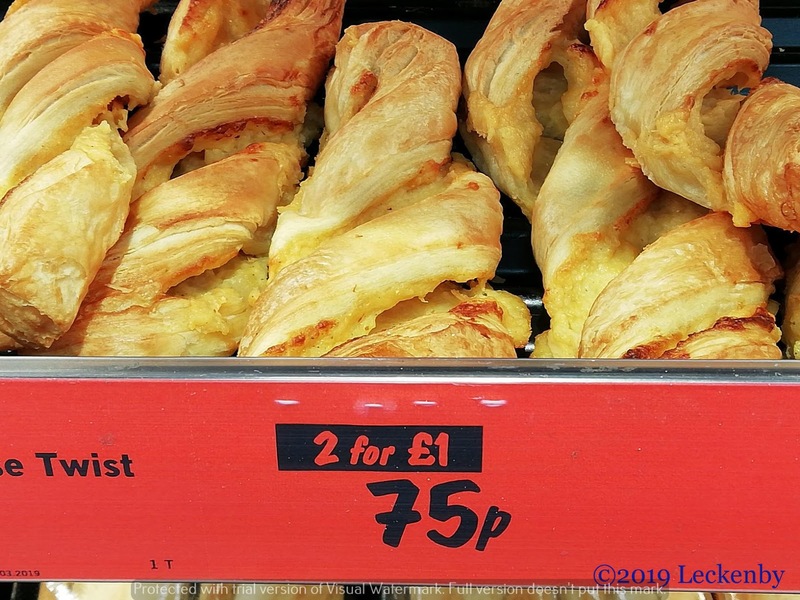 A quick look round to see what was there and purchase our Saturday newspaper. Then we carried on further to Lidl. A stock up on fruit and veg, bread and milk plus one of their free range chickens (very reasonably priced) for tomorrows roast. 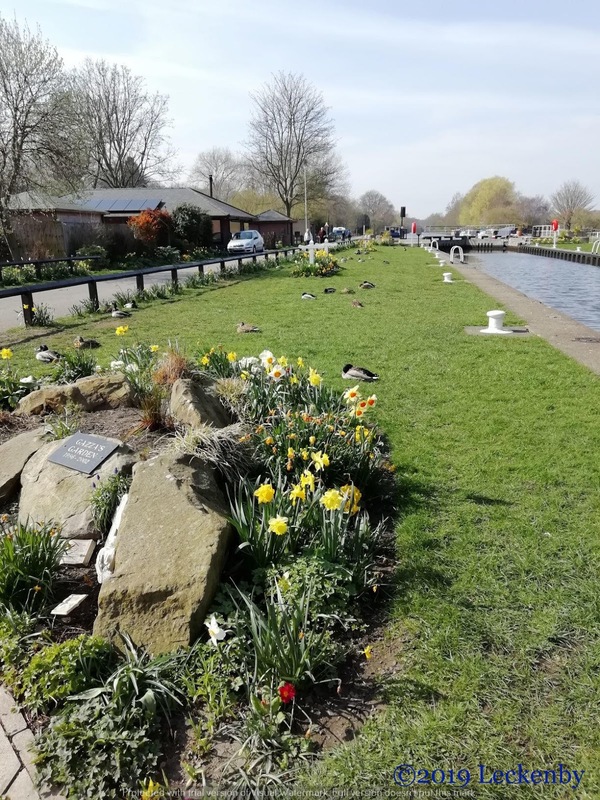 Back at Oleanna we made our way to below Woodlesford Lock to fill with water, the floral displays already visible. 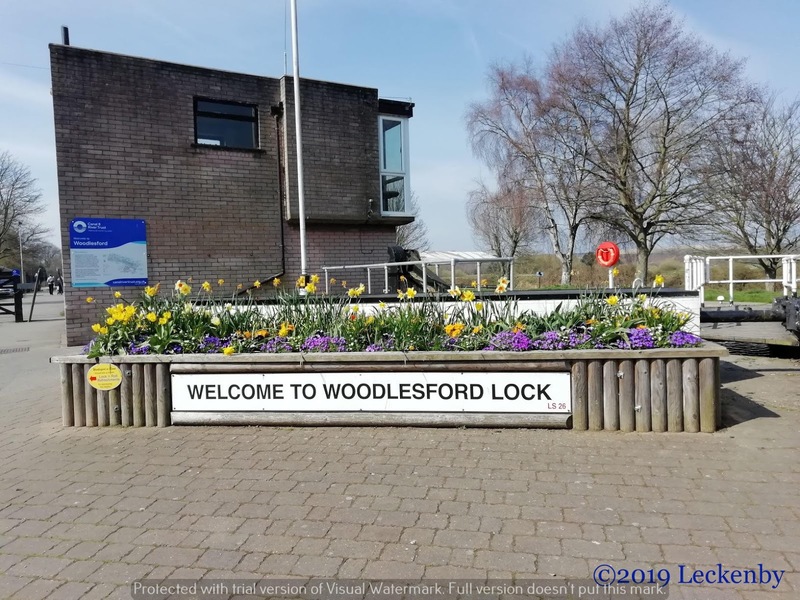 Woodlesford Lock is looked after by the Woodlesford in Bloom team, they do a very good job. When we were here on Lillian last they were hard at work tidying the place up and pointing me in the direction of apple trees. 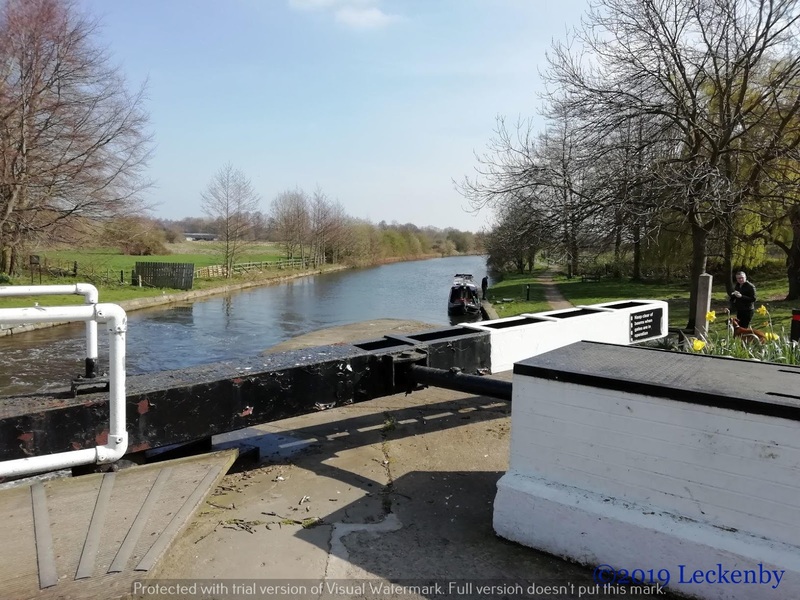 The lock is far less scary than Lemonroyd Lock and passing a rope up to a bollard was hardly necessary as it fills steadily. The one thing I don’t like about it is the bottom gates, they are very hard to see from the control panel. They are operated by a button which you have to hold, but you can’t see if any gongoozlers are stood in front of the beam and therefore going to get biffed by it. There are signs saying to beware, but the excitement of a boat coming can distract from such things. So I tend to stand by the gates until I am fairly sure the water is level and then walk to the panel. Above the lock the moorings were really quite full, but we carried on to where the Winter Moorings had been, winded at a gap in the permanent moorings and pulled in away from the crowd by the lock. Sun would hit the solar panels for the rest of the day and Tilly could explore the trees and run around in the grass. Except it was very busy! Too many cyclists! Too many woofers! A toilet in the trees too! Can we swap this outside with yesterdays please!!!! Why leave your toilet here? There are bins just across the way! After some reading about sour dough starters I decided that mine wasn’t wet enough. The ratios of water to flour I’d been using were correct, but it was still paste like. So I decided to add more water, if it had all gone wrong then I’d only be loosing out on a bit of bottled water (too much chlorine in tap water, which would inhibit the yeast). 120ml extra water and a feed made it look more how I’d imagined, it was returned to my proving shelf opposite the stove. Checking on it a couple of hours later it was frothing up nicely. By the evening I ended up moving it into a larger container as it was increasing in volume. I suspect it is back on track, but a couple of days behind where it should be. If I keep feeding it as instructed I’ll have loads of it. 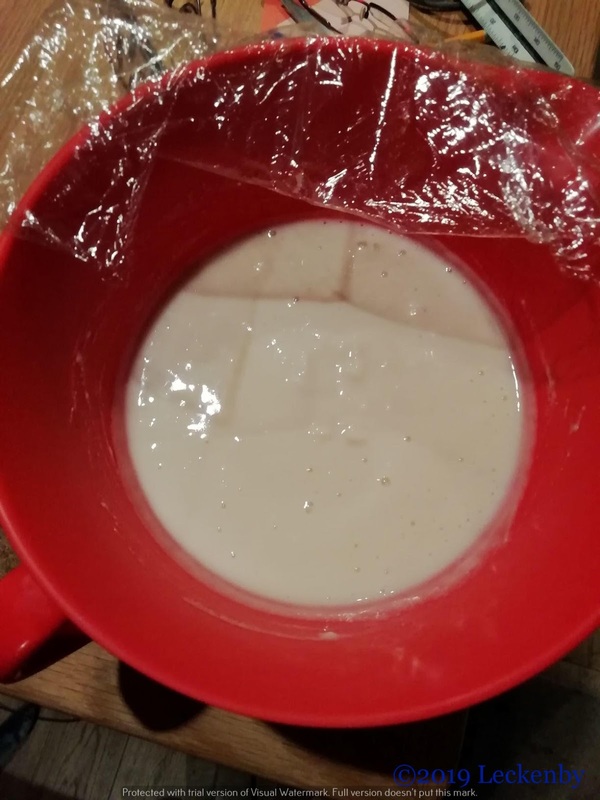 Would anyone like a gluten free sour dough starter? 1 lock 1 mile, 1 wind, 0.5 freezer left, 3 green faces, 7 red! 1 Saturday paper, 1 chicken, 2 many people, 2 many woofers, 0 Mrs Tilly stamp of approval, 120ml extra, 1 foaming monster developing, 1 new blog nearly ready to go live. 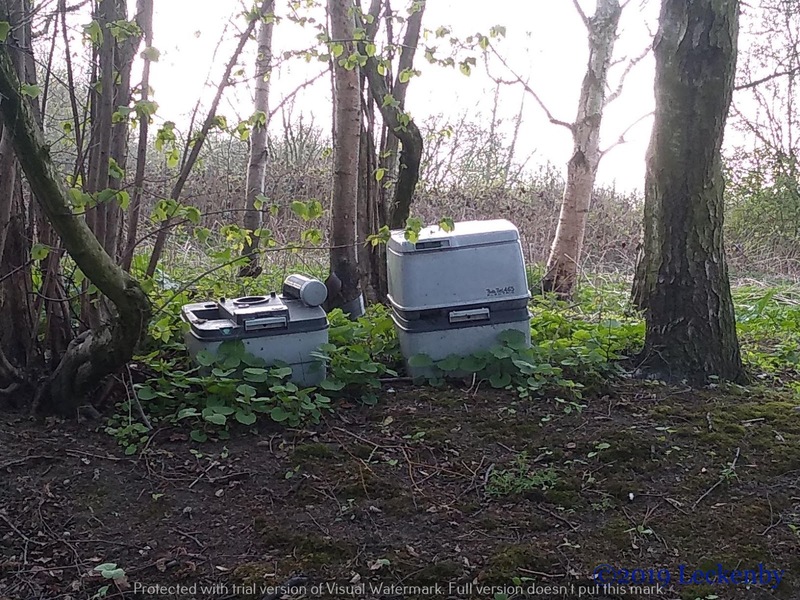 This entry was posted in Uncategorized on 1st Apr 2019 by pipandmick.